Jerry Brown and Hillary Clinton are shown in file photos. SACRAMENTO, Calif. (KGO) -- California Gov. 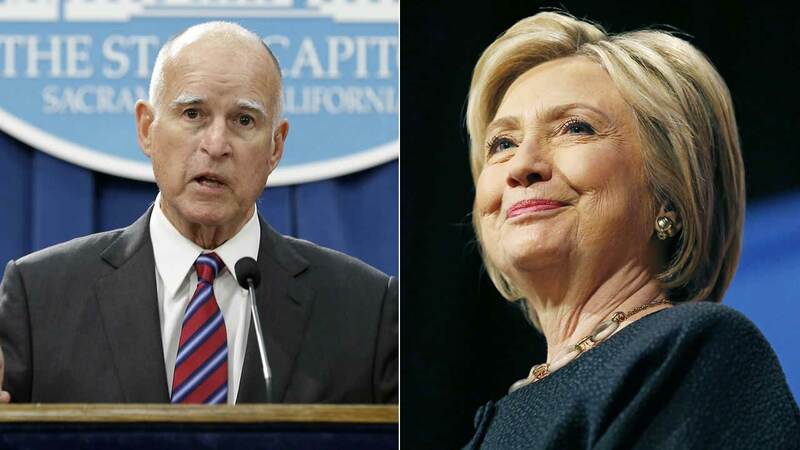 Jerry Brown is endorsing Hillary Clinton just a week before the state's June 7 primary. In an open letter tweeted Tuesday, Brown writes that Clinton has the best shot at stopping Republican Donald Trump, whose candidacy he calls "dangerous." The governor says that while he's impressed with how well Bernie Sanders has done, he believes a Clinton candidacy is the only path forward for Democrats to win the presidency. Brown says Clinton's lead over Sanders is insurmountable. He points out that voters have given her about 3 million more votes and hundreds more delegates.